Whitepapers and Quickstep guides can help you to create your own content for either commercial sale or your own individual project. iClone Developer Guides are in-depth instructions on the steps necessary to create content for iClone with 3D Studio Max. The iClone Developer Guides offer 3D Studio Max artists a comprehensive guide to constructing iClone characters, 3D scenes, accessories, props, cameras, and more. All guides are written to flow with existing pipelines. Learn how to use 3DXchange to export your model in OBJ format, then bring it into ZBrush to customize the finer features such as skin and texture. 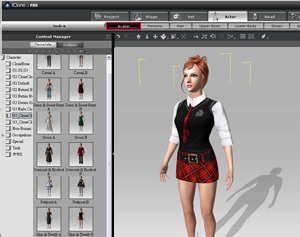 Become familiar with the step-by-step process of exporting characters from Maya for use in your iClone projects through the 3DXchange pipeline. To make a virtual scene that looks natural and more realistic, you must take great care of setting adjusting the environmental map, lighting and materials. One of the fastest and easiest ways to achieve this is by taking advantage of the HDRI features in iClone4. In this document, we will show you how to prepare a mechanical component, rig and animate, add particle effect, and finally, use Dramacsript to control iProp behaviors. You will be able to know the tricks to create an iProp which can be added to a character as an accessory, or make it as reusable iProp itself. In the Sci-Fi content packs, the track movements are made with UV animation which is visually effective but still looks unreal. In this document, we introduce another technique to create a more realistic mechanical looking tracks. Always wanted to create your own unique creatures/ characters that could be fully animated, just like the Legend of Dragon, The Horse or the new Mechanical Base?! Now with this whitepaper, you can learn all the secrets! Learn how to create incredible heads for your characters using ZBrush and importing those heads into iClone! With this whitepaper you can finally learn how to create your own G3 Character! Using 3d max, you can create characters of your dream and create unique accessories to attach to the body parts. Want to create your own animated iProps? Use 3DS Max to create iProps to use in your next project! Learn how to create your own animated materials, using 3DS Max and UV manipulation. How to create your own customized non-human characters, bone systems and animation using 3DS Max. A glimpse of the iClone content creation white paper. Creating Materials with multiple UV channels, then adding animation to those texture channels. Creating simple Google Sketchup Models and prepare them for use in iClone3. Is there any way that I could modify the skeleton and create my own unique character? Of course you can!!! You can create any cartoon character or robot as you wish. Character Studio can be used as iClone3 motion creator. Since we are exporting the motion into iClone3, we will need a biped skeleton with the similar structure as iClone characters. Endorphin is a really easy to use tool that enables us to create any motions for our characters. Create your own unique terrains using 3DS Max. You can control the interaction of the iProp or character by making your own bounding box or other bounding mesh that is constructed and sized in a manner more appropriate to the prop mesh. There has been an update for the G3 Max Templates, you can use the original link given to those accepted into the CCD program to access the updated G3 templates. This short guide explains the differences between T Pose and Relaxed pose as well as the differences between G1, G2 and G3 Max Templates. From iClone3, Reallusion has officially supported 3DS MAX Character Studio (CS), and made CS the standard character motion production pipeline for iClone. For human or non-human characters, the full CS motion export capability has opened the gate to vast designer resources, including game designers and professional animation communities. To perfectly import BVH mocap data, developers can enjoy the power of CS BIP format to retarget motion files with different bone scales or bone segments; It’s so far the best path to convert and fix variously formatted BVH data into iClone. Here you can find the plug-ins for both Maya 7.0 and 3DS Max. Use these templates as blueprint guides in creating your own characters and props for iClone. These templates are designed to give you a quick intro into what you can do. The rest is up to your imagination! iClone & 3DS Max Training Videos Written by: Chris Murray- Author, 3D artist, & Certified Autodesk Training Specialist. With the launch of iClone 5 comes new possibilities with G5 characters. These G5 character templates will provide you with the base you need to customize your own characters in iClone 5. You must be a Reallusion member to access this resource. Basic AML Dummy system with built in animation used in iCar Body Shop to quicly create interactive vehicles. Head for G3 characters for 3DS Max, ZBrush. Now create your own G3 Heads capable of morphing! Anyone certified for publishing content packs in the Content Store is entitled to get the G3 Head Max templates. You can apply for this tool for your creation after your content packs are on sale in the Content Store. The source max files and texture images of the G2/G3 character (essential male & female) in iClone assets, for further modification and creation. Anyone certified for publishing content packs in the Content Store is entitled to get the G2/G3 Character Max templates and the white paper. You can apply for these powerful tools for your creation after your content packs are on sale in the Content Store. Full function and no expiration for Maya 7.0 version or lower (document is not included). Full function and no expiration for 3D Studio Max R8, R9, 2008-2011 (32 bit version). Full function and no expiration for 3D Studio Max R8, R9, 2008-2011 (32 bit & 64 bit versions). Sample files for 3D Studio Max 2011 (32 bit & 64 bit versions). Sample files for 3D Studio Max 2010 (32 bit & 64 bit versions). Sample files for 3D Studio Max R8, R9, 2008 & 2009 (32 bit) version. A Quick Guide to create the different content types available in iClone 4 as well as the functions of the Plug-in. Want to take a look at some of the older resources and quick guides? Or maybe just want to take a stroll down memory lane? No problem! Here you can find the resources and documentation used for older programs. iClone tutorials on working with Autodesk 3D Studio Max and the iClone 3D Studio Max exporter offer a general overview on how to work with 3D Studio Max to create content for older iClone programs. Create camera animations with 3ds Max for iClone. Prepare custom BVH profiles for the BVH converter, so you expand the compatibility of importable BVH file formats. Non-Standard Characters are the models that are skinned to RL bones. Take a look at this Whitepaper to see how to build and what can Non-Standard Characters do to enhance your projects in iClone3. There are as many shapes to LCD signs as there are ways to create them. In this tutorial, we will recreate a common commercial scrolling LCD sign which is rectangular in shape. As to this tutorial you can apply this method to any other props as you wish. Create 3D Text in SketchUp and convert it in 3DXchange for immediate use in iClone3. This is a fantastic and simple way to create 3D Text for application to any scene in iClone. Choosing the right Google 3D Warehouse Model is a tricky thing in Google. How tricky is tricky when tricky is tricky? Did I confuse you?! Peak your interest?! Well, it's all made clear and simplified with this explanation- just take a look it in here! What's in a name?! Everything! Especially when talking about 3D models and their subsequent parts. Follow these tips to improve your efficiency and modeling techniques! Simplify your model by using the Bezier Curves to create the shape of your model. What's after that? Just use Soap Skin and Bubble plug-in to build up the model. "Add a little spring to your step".or props, or anything that you can imagine! In this tutorial we will introduce to you the procedure of creating spring props in 3ds Max. By using this technique you may experience the fun of what Spring Effects can do! Enjoy! The all new iClone 3DS Max plug-in provides more flexibility and speed for creating and exporting content from 3DS Max for iClone. 1. The exporter now shows a status bar for elapsed progress as Max exports VNS files allowing you to easily see the export process and completion. 2. New multi-map effects with added support for: diffuse, glow, bump, reflection, normal, glossiness, two-sided materials. 3. Live Props and Accessories may now have embedded animation from 3D Studio Max able to be exported from Max and assigned to the model in iClone using the iClone timeline. Produce Live Props like animals, cars, and more objects with life-like behavior or mechanical movement built-in for on-demand playback inside iClone. Convert existing 3d models into iClone contents like props and accessories. Replace the display screen in iClone "News" project with your own images. Create your own 3D character customized with the face you import from any JPG or BMP. The iClone 3D content developer guides give you a comprehensive understanding of how to create content for use inside Reallusion? iClone. Creating 3D content for iClone means you will be able to move 3D assets from 3DS Max to iClone and include them in iClone created movies. Whether you intend to export content for use in your own film productions or plan to create content packs that are able to be marketed to other iClone users, the 3D Studio Max developer guides for iClone provide an introduction for beginners and useful tools for pros that make increasing your iClone content library a snap. This document is preserved to conceptual level discussion and process over view at most. Once you've read this section, you can focus directly on areas relevant to your expertise or use all the documents to become an expert all around iClone developer! This quick start guide details the steps you need to accomplish to market your content through the Reallusion Content Developer program. Understand the important character concepts unique to iClone. Effectively create and prepare character geometry to export to iClone. Understand how texture and materials are handled on characters. Place, scale and skin the RL Bone system to your character meshes. Create and manage materials for objects and effects within iClone. Understand the basic shaders that are supported within iClone. Know how to achieve various visual effects with materials. How to create an object to be used in iClone as a stand alone prop or accessory on a character. Successfully prepare animated props and accessories for use in iClone. Determine the appropriate type of environment required for your iClone project. Prepare 3D geometry created in 3DS Max for exporting to iClone. Adjust the position and scale of 3D Scene elements. Export data from 3DS Max and import it into iClone. This guide breaks down the features and settings of the .VNS exported as its used from Autodesk 3DS Max. Full function and no expiration for 3D Studio Max R9 (32 bit) version. Full function and no expiration for 3D Studio Max R6, R7, and R8 version. The Reallusion official iClone character base models will unleash your creativity in producing contents. There are 4 types of character base models from Reallusion: (1) Standard base model; (2) CloneCloth base model (3) CloneBone Character; (4) Character Max Template. 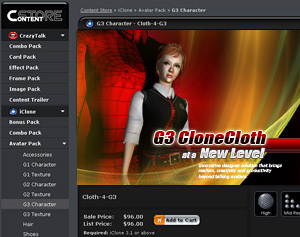 Usually, iClone provides basic standard and CloneCloth base models within the program or bonus pack, and developers can purchase additional character bases from the Content Store or Marketplace. 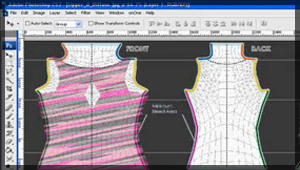 In particular, CloneCloth Characters provide dual layers of Cloth mesh: the skin layer and the cloth layer. 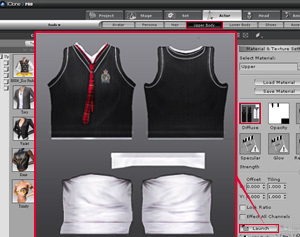 Simply modify the opacity texture with any image editor and you can design as many different clothing styles as you can imagine. Please refer to the matrix below to identify the possible alternatives for submission. There are 4 major types of content for submission: (1) Standard Character; (2) Non-standard Character; (3) Non-human Character; (4) Texture & Outfit. You should select the proper type according to the base models you are using. iClone G3/G5 Character is constructed by standard bones in 3ds Max and compatible with all the face and body animation tools with motion library. 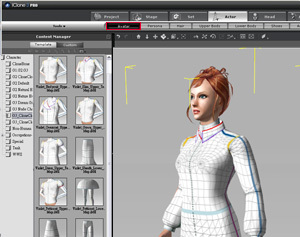 Developers can choose to modify the texture or the body proportion of the character and save as the iMaterial or iAvatar file for submission. Now youâ€™re ready for battle! 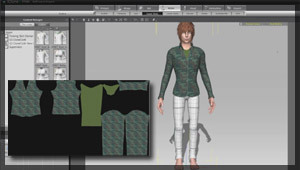 iClone developer Alley uses the New Look G3 CloneCloth to demonstrate the basics of how to design some stylish camouflage army fatigues for your iClone character. Dress your iClone characters to impress by using this thorough guide from iClone developer Duchess. This tutorial demonstrates how to add a bit of a more ‘revealing’ designer twist to your avatar. Prepare your complete work and save it as .iAvatar file under the category of "Character". This .iAvatar file is only for verification since this character .iAvatar file won't be included in your pack. 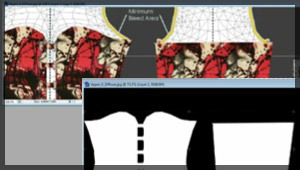 Under "upper body", "lower body", "shoes" tabs (or even "skin"), check the texture channel including Diffuse, Opacity, and save as iMaterial files. Then, drag your material files into Content Uploader with your custom thumb. 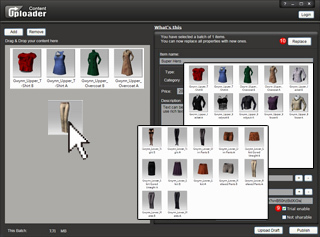 You may also choose to package the seperate material files as a pack or combo item for complete costume delivery. Before you publish these content items for sales, make sure the target base model can be dressed well with these seperate material files. Remember to prepare all the commercialized materials like pack image, pack thumb, and promotional images and videos to make your content attractive and ready for sale.